Sony has decided to release a monster package of material from That's The Way It Is, containing both audio and film material. 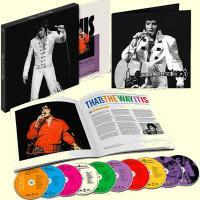 On 10 disc, 8 CD and 2 DVD, this deluxe edition includes every recorded show from August 10 Opening show to the August 13 Dinner show. The DVD's inlcudes the original That's The Way It Is documentary from 1970 (DVD #1) and the updated version from year 2000 (DVD #2). On the 6 CDs focusing on concert recordings, we are presented with two full shows not officially released before. These are the dinner show from August 11 and the dinner show from August 12. Both have been bootlegged, but comes here in glorious sound. Extended Legacy release of That The Way It Is.